The approach of the design of the website for Clever Culmination is based on the minimalistic use of background elements, logo elements, colors, and typography. With the tagline, “Specially different,” the company wants to focus on what it does best without any other distracting information. 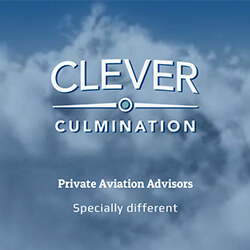 Clever Culmination is a team of seasoned aviation professionals with more than 50 years’ private and business aviation experience. The team of aviation advisors offers real-world operational solutions across a range of areas including long-term asset management and flight operations; aircraft completions and refurbishments; acquisition and sales transactional expertise; pre-purchase inspection oversight; technical surveys, audits, and reviews; and bespoke charter services. All executed to the most discerning standard. We combine our passion for aircraft with discretion, integrity, and transparency. Whether a first-time buyer, long-standing owner or supported by a fully established flight department, Clever Culmination helps our clients do it better. We retain our role as truly independent advisors, with no conflicts of interest – our sole focus and commitment is supporting our clients achieve their aviation goals.